Less than an hour from J’burg Airport we arrived at Irene Country Lodge overlooking a tranquil lake teaming with bird life. After a good night’s rest we played Centurion Golf Club on our first day, playing on a rather soggy golf course which had only opened the day before our arrival after heavy rains the week before! Sadly the river had flooded two holes which were covered with rubbish from the floods – how lucky that we arrived when we did – blue skies greeted us each day from then on. Day two found us at Dainfern Golf Club, on the outskirts of J’burg, only to be told the course was closed – fortunately this was an administrative error, as all courses are closed on Monday’s for maintenance, but we had the course to ourselves and the Proshop had an excellent Sale that kept the Ladies and some Gents happy. A toughie with six crossings of the flooded river to contend with. The next day was a rest day, but our driver Norman took thirteen of us on a tour of Johannesburg visiting the Nelson Mandela Foundation, Presidents House and the Apartheid Museum. Lunch followed in a nice suburb followed by retail therapy at a nearby African Crafts Centre. Glendower Golf Club, home of the SA African Open in 2018 greeted us the next day for the 1st Round of the Individual Stableford. 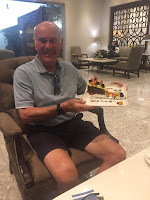 Some good scores were returned, but the highlight was Alan Golbourn getting a Hole in One on the 3rd Hole – both the Golf Course and the Hotel were suitably impressed. Our final day in Pretoria was spent on the delightful Pecanwood Golf Course after a pleasant hour + drive to get there. Despite threatening skies and a sharp downfall, we all enjoyed playing an easier course against each other in the Couples Swapsie.....even those who were not couples! 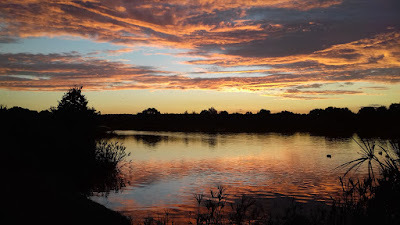 We elected to have a Bar-B-Q that evening at the nearby lakeside which did not quite work, but it was a lovely venue and we returned late to pack up ready for an early start the following morning to Kruger. Leaving before 8.00am we drove through fairly flat landscape for two hours before coming into some beautiful countryside with steep gorges and rolling hills. We finally stopped for lunch at HazyView where a much needed break was enjoyed. Another few hours we arrived at the Hans Merensky Resort stepping out into a different climate entirely – very hot and humid. After such a long day the first impressions of the hotel were not great, with air conditioning issues, changes of rooms etc. However, waking to see impala grazing and monkeys playing outside our rooms soon lightened the mood. Having played on four immaculate golf courses the first week, this one was a complete contrast but we soon elected to place the ball anywhere on the course, including the bunkers which were full of giraffe footprints. ‘Golf in the Wild’ is how they advertise it, and they were quite right, but it was a good layout with some very challenging water holes....with crocodiles. 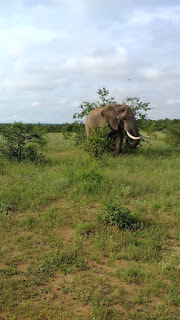 We stayed at Hans Merensky for the remaining week interspersing four golf days with a 5.00am Game Drive followed with an afternoon river cruise. On another day we drove into the Drakensburg Mountains on the Panorama Route visiting Blythe River Canyon and Bourkes Luck Potholes with pancakes for lunch at Harries in Graskop. 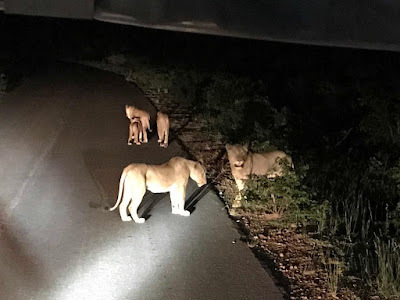 Our final rest day, most played golf again followed by an evening Game Drive where some of us were lucky enough to get really close to a pride of lionesses with one cub – quite magical. Our final golf day was interesting as we were mixed up with a large Am-Am, but managed to play the final round of the Stableford. The Tour Winners were Gillian Curley with rounds of 29 and 34, and Terry Jones with 38 and 34 with the respective Runners Up being Paul and Yogi Jackson – the Rookies! Our final evening was very jolly with the Prize Giving and an impromptu African display by the chef on drum, and the waitresses and kitchen staff all singing, and Michael Pring doing an impressive African dance! 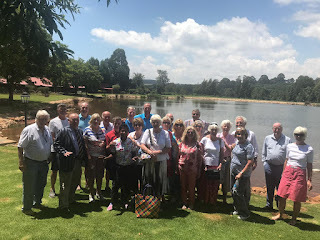 We set off early on the last day driving back to J’Burg this time taking in more lovely scenery through the Highland Way stopping at Dullstrom for a lovely lunch at Critchley Lodges, and arriving at the Airport in good time. This Tour was certainly a full itinerary, but in true GSGB style everyone took it in their stride and despite the heat and malaria pills, we all coped ! Here's a screen grab of the T's and C's for the AGM at East Sussex National July23rd and 24th 2019. 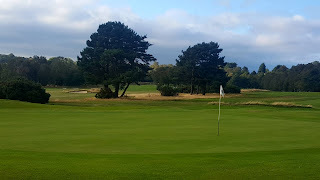 The GSGB August Meeting straddled the Surrey, Hampshire border when we visited Camberley Heath GC (Surrey) and Army GC (Hampshire), two lovely wooded heathland courses. 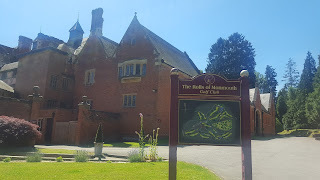 Good weather was enjoyed on both days by the 59 members who attended, the temperatures being much more manageable than those experienced at the Belfry during the July heat wave. Camberley Heath is a fine course containing all of the characteristics of Britain's finest heathland layouts. With heather, bunkers and pine trees in abundance, Harry Colt must have been delighted to be offered such an attractive free draining piece of land on which to build a golf course. Unfortunately the greens were not at their best following the annual maintenance programme but the rest of the course was magnificent with some particularly attractive (some might say penal!) bunkering on show. This however didn't stop some excellent scores being registered, particularly by the men. The course also boasts a challenging and memorable quartet of par-3's and it's easy to see why it's consistently ranked in the list of England's top 100 courses. At Dinner we were joined by the husband and wife team of Kevin and Debbie Warner who are fulfilling the roles of club Captain and Ladies Captain in the same year. Kevin accepted the £500 Society cheque from GSGB Chairman Giles Hinchcliffe before speaking about Camberley's very strong junior section. You can view the photos from the prize giving here. Perfect playing conditions greeted everyone on Day 2 at the Army and although the course is not as heavily bunkered as Camberley, the tree lined fairways, ditches and fast greens provided more than enough of a challenge. That however didn't stop Martyn Pellew from scoring a very impressive 43 points to add to the 36 he registered on the first day which comfortably brought home The King of Morocco Cup by 5 points over Ian Edwards who is also a Woburn member. Ian's total of 74 points would have comfortably won the cup in any of the previous five years. The Society Salver was narrowly won by Gillian Curley from Northants County with 69 points over Vanessa Adams from the Warren with 68 points. The next event will be at Moortown / Bradford on September 26th – 27th. After such a long, wet winter who would have thought that we would be playing golf on firm and fast courses with slick greens and brown fairways by the month of June. Glorious sunny weather was enjoyed on both sides of the Welsh border as the GSGB took on two very attractive parkland courses at Ross-on-Wye and the Rolls of Monmouth. 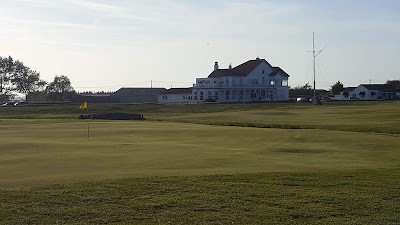 Both were in good condition throughout but a combination of fast and undulating greens set a stiff examination that was beyond most of our members. A field of 53 players took part and it was no great surprise to see just two players play to their handicap over the two days. At Dinner we were joined by the Ross-on-Wye Captain, Mr Robert Tuttiet and his wife Irene. Robert accepted the Society donation of £500 for their junior section from GSGB Chairman Robin Moser before speaking of the clubs tremendous success growing their junior section from just 30 to over 100 boys and girls over the past 5 years. The Founders Trophy for men was won by Terry Jones from the Warren with 71 points. The ladies Founders Trophy was won by Terry's partner, Vanessa Adams, also from the Warren who scored 59 points. David Kerr from Northants County and Rosemary Lilley from Portal were the aggregate runners-up. A full list of all prize winners can be seen below. 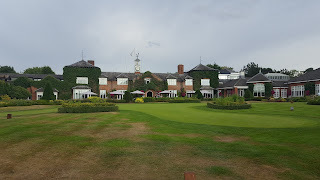 The next event will be the AGM meeting at The Belfry on July 26th/27th. The GSGB accounts for 2018 are now posted in the GSGB members area. We have a new relationship with a golfing goods supplier and are now offering GSGB branded goods to members. Here is single page summary of the products available. The simplest method to order these items is to contact the GSGB office on 07760777736 and Brian will deliver any goods at the next GSGB event.